And, WOW, was I right! With Julie’s guidance, I covered everything from my childhood to a job I had at the time that wasn’t contributing to my well being. During individual therapy, I learned to say the golden phrase “Let me get back to you” rather than making split second decisions which I would later regret. I also learned, through a series of 12 Week group classes, that others were having the same kinds of problems I was, and I didn’t feel so alone with their insights, as well as Julie’s guidance. 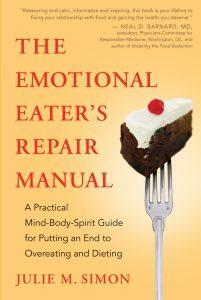 The phrase “Signal-Based Eating” is emblazoned on my psyche for evermore, and, yes, I’m still working on this daily. 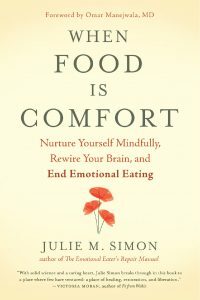 Work with Julie individually and in group work taught me how to cope with potential problems and work to solve them, instead of becoming victimized by them, and then ending up eating myself into a stupor! When I started with Julie, I weighed between 160-165 lbs. I now weigh between 130-135lbs. and feel good about myself. When I see I am starting to gain weight, I look at what my life is, and change the situation. I am grateful that I was lead to work with Julie and I continue using her guidelines in my life on a daily basis.